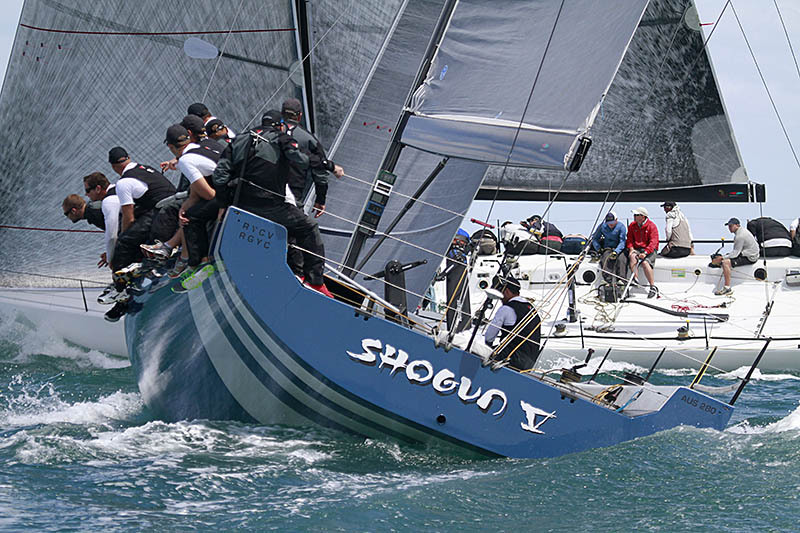 The TP52 Southern Cross Cup is shifting to Sydney for the second half of the inaugural four-round competition that has rejuvenated the class in the Southern Hemisphere. Round 3 of the series, hosted by the Royal Sydney Yacht Squadron at Kirribilli, will add plenty of sizzle to the harbour city’s spring sailing program over the three-day weekend, November 22nd - 24th. The Sydney turnout will be quite different to the fleet that was in the Melbourne starting stalls. Rob Date’s Scarlet Runner is in the Northern Hemisphere taking on many of the world’s signature ocean races and regattas while a couple of the Melbourne based TPs have left the competition. A stronger NSW contingent and second international entry comprise the handful of newcomers. Owner of the New Zealand TP52 Vamos (formerly Shogun 2), Connel McLaren, is set to line up against his Kiwi countrymen on the Hong Kong based Team Beau Geste. Chinese businessman and skipper Karl Kwok and his mostly New Zealand crew, including helmsman Gavin Brady, scored back-to-back wins with Team Beau Geste on Port Phillip Bay in February and March, and hold a commanding pointscore advantage. During the recent America’s Cup showdown in San Francisco many Aussies were gunning for their South Pacific neighbours. For the remainder of the inaugural TP52 series, like for any high profile Trans-Tasman sporting contest neighbourly relations rank second. After two rounds and 16 races the high-octane mix on Team Beau Geste lead the pointscore on 26. Nearest rival, Marcus Blackmore’s Hooligan has a 19 point gap to close. 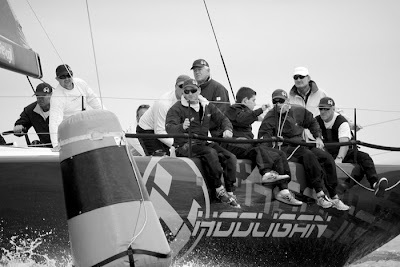 On recent form Hooligan is the sharpest Australian TP52 on the eastern seaboard, leading the current Audi IRC Australian champion, Rob Hanna and Shogun V, both in this series and in the IRC big boat division at Audi Hamilton Island Race Week back in August. Newcomer to the TP52 Southern Cross Cup but certainly not to the sport is Bob Steel and his older generation TP52, Quest, with regular helmsman Jamie MacPhail at the wheel. Bringing boat loads of youth and enthusiasm to the Sydney crew is 18-foot skiff champ Seve Jarvin and his skiff crewman Sam Newton, not long back from a stint as grinder for Oracle Team USA at the America’s Cup. “We are looking forward to being part of the series,” said Steel who recently embarked on a comeback to competition and form with his 2008 Rolex Sydney Hobart overall winner. On recent modifications Steel commented: “I’ve gone back to runners, which I think it pretty good for an ancient seaman. If you want that extra molecule of speed you have to roll over and do what everyone else is doing. “We are mindful we have an older boat, however we have a handicap to reflect our status. We’ve been working hard on the boat and we are going to go out there and do our very best against the newer and quicker TPs. We’ll have fun for the first 100 metres anyway…” Steel joked. Hanna’s Shogun V from Geelong leads the Victorian cavalry and Tony Lyall’s older generation Cougar II from Hobart is making a great effort to continue representing the Royal Yacht Club of Tasmania. Sandringham Yacht Club’s location and regatta management is a tough act to follow but class president Terry Wetton says the Sydney clubs hosting the final two rounds, RSYS and the Royal Prince Alfred Yacht Club on Pittwater, have equally impressive resumes when it comes to running prominent yachting fixtures. Like SYC, Round 3 will be smack bang in front of the viewing public with three days of inshore windward/leeward racing on Sydney Harbour dodging ferries, jet cats and criss-crossing with regular club fleets. Following the sudden death last week of Melbourne based Jason Van Der Slot, owner of Calm 2 and co-owner of Calm, the Australian TP52 class has acknowledged his contribution. Thursday November 21st is a dedicated practise day ahead of the three-day in-harbour grudge match for TP52s and their derivatives, overseen by PRO Denis Thompson.